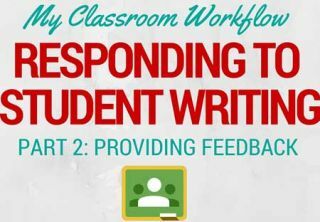 In Part 1 of this topic, I discussed my ideas and preferences for creating assignments and my workflow in Google Classroom. Assigning the work is easy, but it’s in deciding how to read, respond to, and grade, where things can get complicated. I made a huge push last year to not waste time and to help students find ways to be more productive, too. Technology can help us do this in powerful ways. When students submit work that does not meet minimum requirements, I do not accept it or provide feedback to it. I want to students to hold themselves accountable, to take pride in their work, and to submit their best efforts. This doesn’t mean the work has to be perfect, but it should be a true attempt at learning and following guidelines. When students have turned in work on Classroom, I open it all up right away. I don’t necessarily read it then, but I skim and preview. I like to do this through Classroom, by opening up each document but you can also preview it through the Classroom folder in Drive. I use CNTRL + click to open in a new tab and open 5-10 at once. Then, I scroll through with ALT + TAB to rotate the open tabs and close each one with CNTRL + W to close out each tab. In 5 minutes, I can skim an entire class set of work and at least know which students did not meet the requirements. And then, I return some of it. By checking off a group of students in a class, you can return and provide private comments or e-mail feedback just for those students. I write something like: This work does not meet the requirements and cannot earn credit. Please revise and resubmit my tomorrow night or make an extra help appointment. Students who follow these directions will later submit work that is stronger, and I’m not wasting time responding to the work that isn’t ready. Turn it In or Else! If you follow the wisdom of the blank template assignment (see Part 1), you can see students��� work in progress whether they are turned in or not. However, I will only read work that is turned in. For me, reading work in progress to provide a summative response and feedback is akin to searching their binders to find the work the students forgot to turn in. I hold my students responsible for hitting that Turn it in button or Mark as done, as is applicable. This teaches consistency and responsibility, and gives them another indication that strong procedures matter. I used to be a big fan of shorthand and abbreviation in responding to student work. I taught editing marks and had them practice using them in peer feedback. Technology gives me more ways to provide feedback, but drawing all over a Google Doc, and matching my handwritten symbols to electronic ones, isn’t always the most productive use of time. I’ve explored Chrome extensions like Permanent Clipboard to save canned comments but couldn’t get used to it. The best advice I have for commenting on work is find a balance that makes sense for you. I’m an English teacher so I usually grade writing and comment a lot. What I do isn’t the end-all-be-all, but it does allow me to give more feedback than ever before and to do so faster and better. Find some screenshots of these three steps at the bottom of this post. In Text Comments. I open the Google Doc and insert comments in response to specific lines, words, paragraph, etc. These are like my editing marks and are usually specific and focused. Depending on the assignment or student, I will leave anywhere from 4-10 comments (or more). I’m not a fan of suggested edits, generally, but may start to use them a little more this year. I want to make sure the students are doing the work towards growth and revision, not me. Return Comments. I rarely comment on common trends across a class in individual’s work. Instead, I wait for my return comments. I take notes as I grade and find the big picture stuff that every student should consider, trying to keep it important and constructive, balancing the positive and negative. I then return the work to all of my students at once, but only have to write the comments once. I use this space for the summative and holistic comments, typically, and can also break them down into smaller groups of return batches. Rubrics. This really comes in between 1 and 2, but I typically use Google Sheets Rubrics with Doctopus and Goobric to assign rubric-based grades to writing. I also provide summative comments for the individual here. Now my students have feedback in three different ways to help them understand the qualities of their work. Goobric and Doctopus deserve their own posts but you can find out so much with a quick Google search if you’re interested. Will the updates to Google Classroom change my practice? I would love to hear your feedback--comment away or reach out on Twitter.